Bombs, bombs, and more bombs. 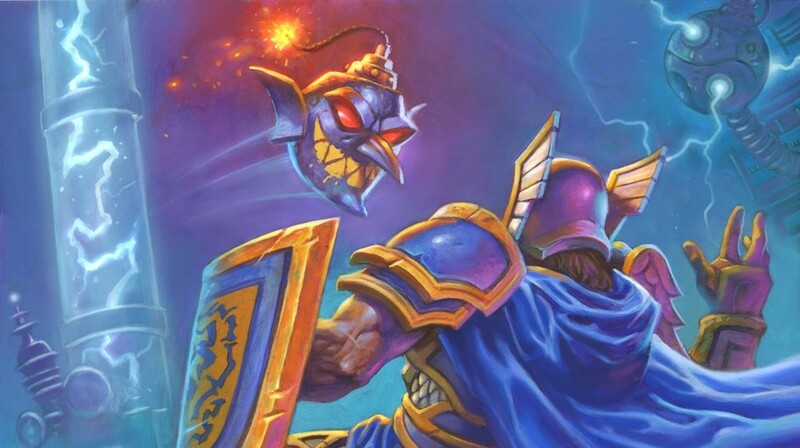 Boomsday brought many new and fun aspects to the Standard Hearthstone metagame, and one of the most notable is the reintroduction of mechs. While mech synergy has not taken off for every class, it impacted Hunter in a big way. The metal minions have not only allowed the class to build in a brand new direction, but have also injected it with some raw power. Bomb Hunter is a fast deck that utilizes a slew of different utility minions to control the board and pump out massive amounts of damage. Though the build still has a few question marks, more than a few people have piloted the archetype to legend. We will break down one of those lists in the following guide. You cannot discuss Bomb Hunter without breaking down the bombs. Goblin Bomb is a very unassuming card that packs a ton of power. Not only does it present face damage at all times, but it gives you a body that works with the magnetic keyword. In this list, you can create the 0/2’s with Bomb Toss, Whirliglider, Explodinator, and Boommaster Flark. Those minions pump out the bombs, stacking up pressure and presenting you with mech synergy at the same time. This deck can take a few forms, but it is mainly a swarm deck. That is important because the Goblin Bomb’s Deathrattles allow you to both attack and play minions at the same time. There will be many games where you play out some bombs, your opponent clears them (taking damage in the process) and you immediately slam them with more. The only general rule is that, as so many of your threats are army-in-a-can style minions, you never want to play multiple at same time unless you’re specifically trying to get lethal or you’re facing aggro. In slower games you can run out something like an Explodinator and Dire Wolf Alpha to see how your opponent reacts. If they clear, hit them with something like Boommaster Flark or Giggling Inventor/Whirliglider. If they don’t, push face. Cybertech Chip is very powerful card. While it has many similarities to Infest, the two mana spell is much better for two reasons. One, it is one mana cheaper, giving you more ways to fit it in. Two, you have many, many ways to fill up the board. Slamming down a bunch of small mechs and then hitting them with Cybertech Chip not only invalidates AOE, but it also allows you to trade in with small bodies and turn them into beefy threats. Magnetic being a keyword is what makes this card so powerful because chances are you’re going to get something you can use as a buff. In that way, if you ever untap with this when facing other board-centric decks you can trade in, see what you get, and then react accordingly. Getting a magnetic minion in those scenarios to put on something like a Mecharoo can instantly swing the game. If this card is in your hand early against a midrange or control deck and you have a decent board (three or more minions) you almost always want to take the time to stick it. Decks like Bomb Hunter need a lot of synergy to work. While the magnetic keyword offers quite a bit of that, it is always nice to have some extra interactions. For that reason, Fireworks Tech is a central part of this build. The two drop has weak stats, but it more than makes up for that with an incredible ability. An extra 1/1 on a mech is strong in the early game and when pushing damage. Plus triggering a free Deathrattle is insane. This card is best on turn two after a turn one Mecharoo (giving you a 2/1, 2/2, and a 1/1) but it has many different uses. Being able to trigger a Goblin Bomb and then trade it for a minion for four quick damage is a great way to get through taunts. Hitting a Replicating Menace can instantly give you the board. The most important use for this card is Spider Bomb, which allows you to push through large threats. Just remember that you don’t have to use this card on Deathrattle mechs. Sometimes it is best to buff up Venomizer so it can trade into a 2/2 and live. Though Stitched Tracker is not a new card, it is important. The 2/2 is in this build because there are many specific minions you want at specific times. Mossy Horror is great against both Spreading Plague and Giggling Inventor, while Boommaster Flark is perfect for when you need to rebound or find lethal. Other times you just need a Venomizer or Spider Bomb to attach to a Goblin Bomb to get the board. There are quite a few one-offs in this build. Stitched Tracker is what allows you to run them. This is your toolbox card. Just be careful about going for the flashiest pick. It’s very easy to grab the biggest body out of instinct, but you always need to react to the board first and foremost. Zilliax might be awesome, but he does you little good when you need to go wide. There are many finishers that can be put into this build. The two strongest are Deathstalker Rexxar and Boommaster Flark. Deathstalker, while cut from a few lists, is still solid because he generates a ton of value against some of the more popular decks in the meta. If you ever find yourself in a game where you don’t have quite enough damage to push through, switch to the Death Knight. His battlecry is amazing against aggressive decks. Using him for Zoo is a great way to get the board. Boommaster Flark is the finisher because he represents a ton of damage. Four bombs is eight damage right off the bat, and the 5/5 body also pumps out a lot of pressure. He is the perfect top end for a deck like this. Control Warlock is one of the most popular decks in the current meta. This game is an absolute race, trying to kill your opponent before they get to their Voidlords/Bloodreaver Gul’dan. As such, you need to hit the ground running as soon as possible and never let up. Utilize your hero power as much as you can, and do everything you can to get bombs onto the board. Hellfire might be a strong clear, but it’s much worse when it costs seven or nine life. The main way you pace this one is by putting out minions, getting them cleared, and putting out more minions. As long as some of those minions are bombs you should be able to take the day. Warlock is not built to deal with that much constant damage. They also are not great against large, single target threats. Magnetic minions have charge if you have a mech on the board. Remember that, and try you best to get something to stick when your opponent is low on life. Another important note about this matchup is to be careful about switching into Deathstalker Rexxar. If you know you can’t kill your opponent before turn ten he can be a good route to take. Though Zoo is powerful, you can flood the board better. Bomb Toss/a buffed Mecharoo are fantastic early on against things like Flame Imp and Lightwarden, while Giggling Inventor, Explodinator and Whirliglider all give you plenty of ways to match swarms. The new versions of Zoo want to go wide. Your goal is to match them card for card. Spider Bomb is one of the most powerful cards in this matchup. The 2/2 seems unassuming against a lot of small minions, but being able to double dip with Fireworks Tech or trade into a minion to kill two things at once is very valuable. All of your plays in this game should be about making sure your opponent has no minions on the board. There are more than a few Druids out there right now, they’re all built around combo finishers. You want to create a few big threats that can bash your opponent over and over again. Going big on magnetic is a great strategy here, but be careful about Lesser Jasper Spellstone. You should only play a lot of bombs if you can instantly trade them in with something like Dire Wolf Alpha, or if you can kill them with Void Ripper. Ripper is great insurance against Spreading Plague as well. Druid has tons of healing, which means they won’t give you too many opportunities to kill them. Build quickly, hit hard, and never stop going after your opponent. Wargrear is an all-star in this game. Buffing up a mid-game bomb while your opponent ramps is one of the best ways to end things before Ultimate Infestation gets going. Odd Rogue is one of the fastest decks in the game. To combat that, you want to keep them on the ropes as much as possible. As strong at the class is, they are not good at dealing with wide boards. You want to pump out as many threats as possible. That will force your opponent onto the back foot, which keeps their focus on the board. The more time they spend chipping away at threats, the more breathing room you’ll have to operate. Your first focus should always be on cementing the board and ensuring that your opponent cannot get anything going. Always respect Rogue and never ignore a threat because it’s too small. All it takes is one Deadly Poison/Cold Blood into a Vilespine Slayer to find yourself completely locked out of the game. Be defensive here and only think about damage once you answer your opponent’s initial push.